Here a simple bread filling is accented with anchovies, and the lovely flavor permeates artichokes while they steam. In choosing artichokes, look for firm stems and unblemished leaves. Size is not an indicator of quality. Make it a meal: These are a delicious accompaniment for Roman-Style Chicken. Grate zest from lemon, measure 1 teaspoon of zest and reserve. Slice the lemon in half; cut one half into thin slices, keeping the other half intact. Drain anchovies, reserving the oil. Mash anchovies in a medium bowl, then stir in breadcrumbs, parsley, Parmesan cheese, oregano, thyme, pepper and the reserved lemon zest. Trim artichoke stems, leaving about ½ inch, so that they will stand upright. Pull off the short, tough lower leaves of the artichokes. Cut off the top ½ inch of each artichoke, then use a scissors or sharp knife to trim off the sharp points of the remaining leaves. Rub the whole artichokes, especially the cut portions, with the cut side of the half lemon. Turn the artichokes upside down and rap them on a counter to loosen their leaves, then gently spread the leaves open like a flower. Spoon the breadcrumb filling into the openings, filling the leaves. 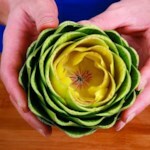 Tap each artichoke lightly on the counter to help the filling settle inside the leaves. Place the artichokes in a heavy saucepan or Dutch oven with a lid so that they fit comfortably standing up, but are not crowded. (Use 2 pans if necessary.) 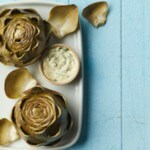 Drizzle the top of each artichoke with about ½ teaspoon of the reserved anchovy oil. 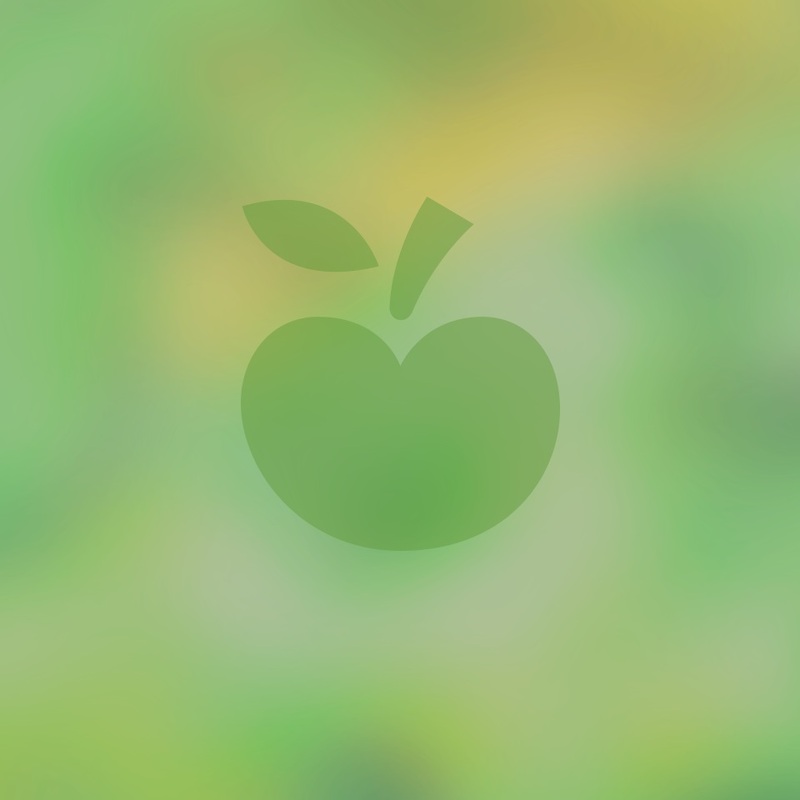 Carefully pour water in the pan to a depth of about 1½ inches. Add the lemon slices and squeeze the juice from the remainder of the lemon half into the water. 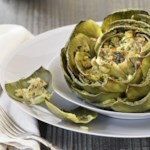 Cover the pot tightly and steam the artichokes over low heat until they are tender to the core when pierced with a skewer, but are not so soft that they lose their shape, 35 to 45 minutes. Remove them from the pot with a slotted spoon and let drain on a plate. Serve warm or at room temperature. Make Ahead Tip: Cover and refrigerate the stuffing (Steps 1-2) up to 1 day in advance. 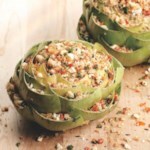 The stuffed artichokes can be cooked up to 2 hours ahead and kept at room temperature. 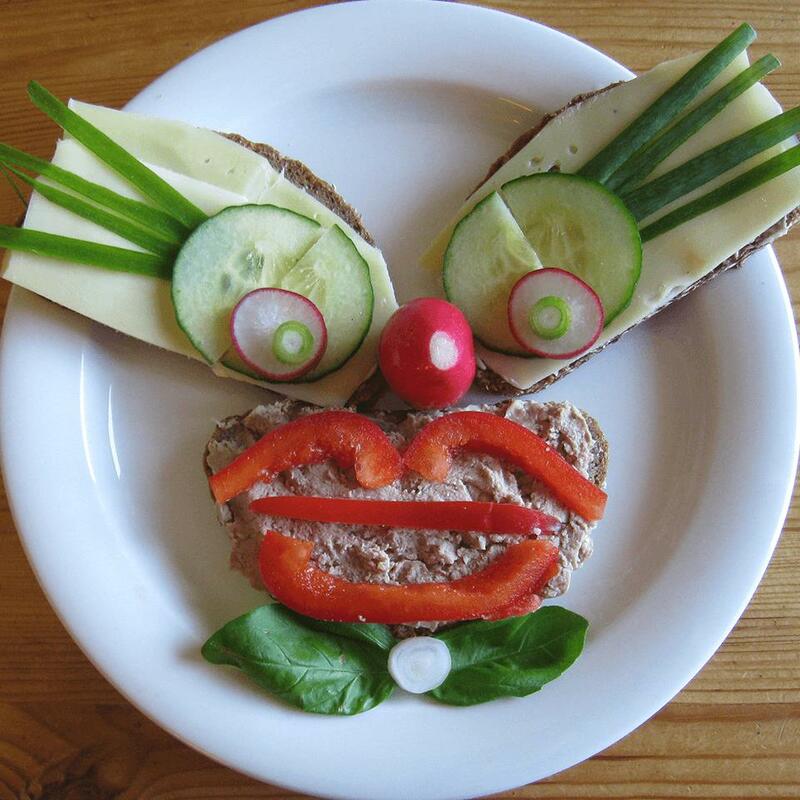 ONE OF MY *FAVORITE* CHILDHOOD COMFORT FOODS!! (EXCEPT FOR THE ANCHOVY - NONE OF US KIDS WOULD TOUCH THEM, SO MOM&DAD ALWAYS SKIPPED THAT) MOM ALWAYS USES LOTS OF CHOPPED GARLIC IN THE BREADCRUMB MIX, MY AUNT STICKS SLICES OF GARLIC BETWEEN THE LEAVES. WE ALWAYS HAD A SMALL BOWL OF MELTED GARLIC BUTTER TO DIP EACH LEAF IN BEFORE EATING. NOW THAT I'M GROWN, I TRY TO BE A LITTLE HEALTHIER & MIX 1/2 BUTTER & 1/2 EXTRA VIRGIN OLIVE OIL. YUMMMMMM!